A new study found that an HIV drug significantly reduces age-related inflammation and other signs of aging in mice. "This holds promise for treating age-associated disorders including Alzheimer's," said John Sedivy, professor of medical science and biology at Brown University. "And not just Alzheimer's but many other diseases: Type 2 diabetes, Parkinson's, macular degeneration, arthritis, all of these different things. That's our goal." Age-related inflammation is an important component of age-associated disorders. The findings were published on Thursday, Feb. 7, in the journal Nature. The collaborative research project included researchers at Brown, New York University, the University of Rochester, Université de Montréal and the University of Virginia School of Medicine. According to Sedivy, the HIV drug acts by halting retrotransposon activity in old cells. Retrotransposons—DNA sequences able to replicate and move to other places—make up a substantial fraction of the human genome. Retrotransposons are related to ancient retroviruses that, when left unchecked, can produce DNA copies of themselves that can insert in other parts of a cell's genome. Cells have evolved ways to keep these "jumping genes" under wraps, but as the cells age, the retrotransposons can escape this control, earlier research from Sedivy's lab showed. In the Nature paper, the research team showed that an important class of retrotransposons, called L1, escaped from cellular control and began to replicate in both senescent human cells—old cells that no longer divide—and old mice. Retrotransposon replication, specifically the DNA copies of L1, is detected by an antiviral immune response, called the interferon response, and ultimately triggers inflammation in neighboring cells, the researchers found. These retrotransposons are present in every type of tissue, which makes them a compelling suspect for a unified component of cellular aging, Sedivy said. Understanding that, the team uncovered the interferon response, the potential mechanism through which these jumping genes may cause cellular inflammation without necessarily causing damage to the genome. "This interferon response was a complete game changer," Sedivy said, noting that it is hard to track where newly inserted transposable elements may have inserted themselves in a genome that contains a vast number of inactive and active retrotransposon sequences. The interferon-stimulating copies of L1 DNA require a specific protein called reverse transcriptase. HIV and other retroviruses also require reverse transcriptase proteins to replicate, Sedivy said. In fact, AZT, the first drug developed to treat HIV/AIDS, halts HIV reverse transcriptase. Current multi-drug cocktails used to treat or prevent HIV/AIDS still contain specific reverse transcriptase inhibitors. Sedivy and his colleagues thought that this class of drugs may keep the viral-like L1 retrotransposon from replicating and thereby prevent the inflammatory immune response. 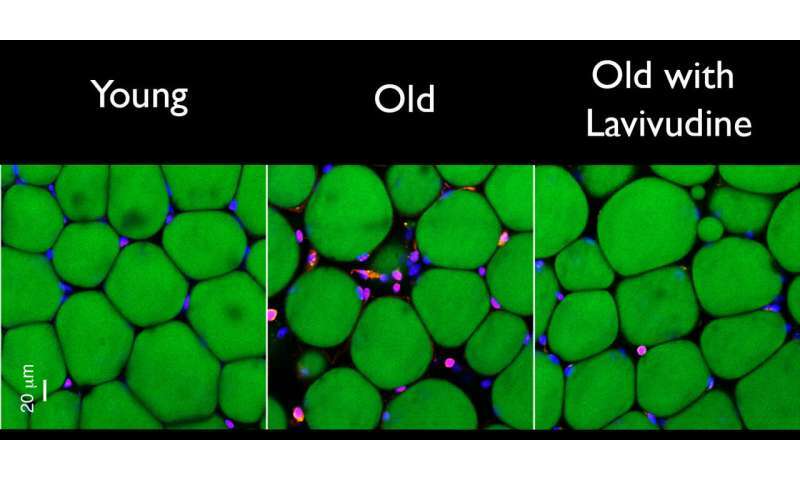 Growing human cells in the presence of lamivudine did not impact when the cells reached senescence or kill the senescent cells, Sedivy said. But lamivudine did decrease the interferon response and the late-stage senescence-associated secretory phenotype (SASP)—the important characteristics of senescent cells that promote inflammation in their neighbors. "When we started giving this HIV drug to mice, we noticed they had these amazing anti-inflammatory effects," Sedivy said. "Our explanation is that although L1s are activated relatively late in senescence, the interferon response reinforces the SASP response and is responsible for age-associated inflammation." The results were encouraging, Sedivy said, but there's more work to be done. "If we treat with lamivudine, we make a tangible dent in the interferon response and inflammation," he said. "But it doesn't quite go back down to normal. We can fix part of the problem, but we don't actually understand the whole aging problem yet. The L1 reverse transcripts are at least an important part of this mess." Sedivy is eager to translate the findings to humans. Specifically, he would like begin clinical trials of lamivudine for various age-associated conditions such as frailty, Alzheimer's disease and arthritis. Lamivudine was approved by the Food and Drug Administration in 1995, has been used to treat HIV/AIDS for decades, and its pharmacological activity and safety are well established, Sedivy said. The new clinical trials could be streamlined and focused on lamivudine's efficacy in treating age-associated disorders, he added. He would also like to develop a new reverse transcriptase inhibitor specifically for the L1 reverse transcriptase. To aid in developing a specific therapeutic with minimal side effects, the molecular structure of the L1 reverse transcriptase needs to be determined, he added. Researchers could also develop other types of drugs that target the L1 retrotransposons.